A.F. Basset, Tehidy Park, Cornwall (according to a an old label attached to the reverse). California Palace of the Legion of Honor, San Francisco. Elizabeth Jones was the eldest daughter of Richard Jones, 1st Earl of Ranelagh, a prominent member of the Court of King Charles II, Member of Parliament for Roscommon (1661-66), Governor of Roscommon Castle (1661) and Chancellor of the Irish Exchequer (1668-74), and his wife Elizabeth, daughter of Francis Willoughby, 5th Baron Willoughby. She was celebrated for her beauty and as early as 1679 it was rumoured that she was the King's mistress. She married John Fitzgerald, 18th Earl of Kildare (1661-1707) in June 1684, and they lived in St. James's Square, London, where her father was also a resident. Stylistically this picture would appear to date to circa 1680. This portrait can be compared to the portrait of Lady Elizabeth Jones, Countess of Kildare, by Willem Wissing, which descended in the collection of the Earls of Kildare until 1984 and is now in the collection of the Yale Center for British Art in New Haven (see Painted Ladies, Women at the Court of Charles II, catalogue to the exhibition at the National Portrait Gallery, London, 2001, no. 98, illustrated). 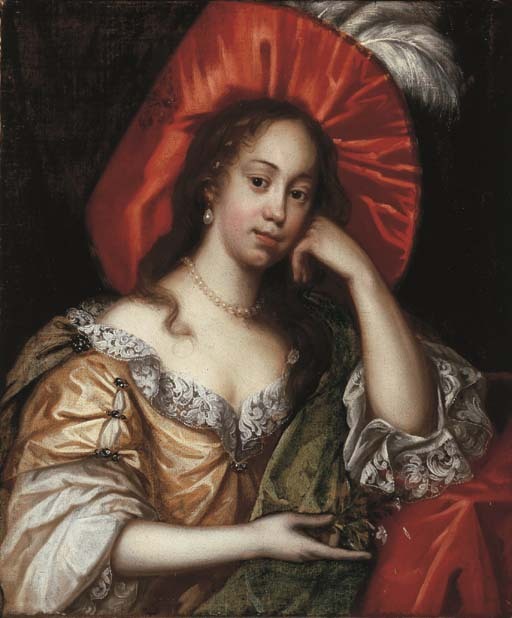 The Countess of Kildare also sat to Sir Peter Lely circa 1679 (see R.B. Beckett, Lely, London, 1951, p. 49, no. 272).